For the third year in a row, a new cohort of Saga Fellows united at East-West University in Chicago on the eve of the upcoming school year. Their mission? To launch the fun and rigorous training required to start their year of service as a Saga Fellow. Saga Fellow training is a 10-day orientation program that brings new and returning Saga Fellows, Site Directors, and National Leadership under one roof. 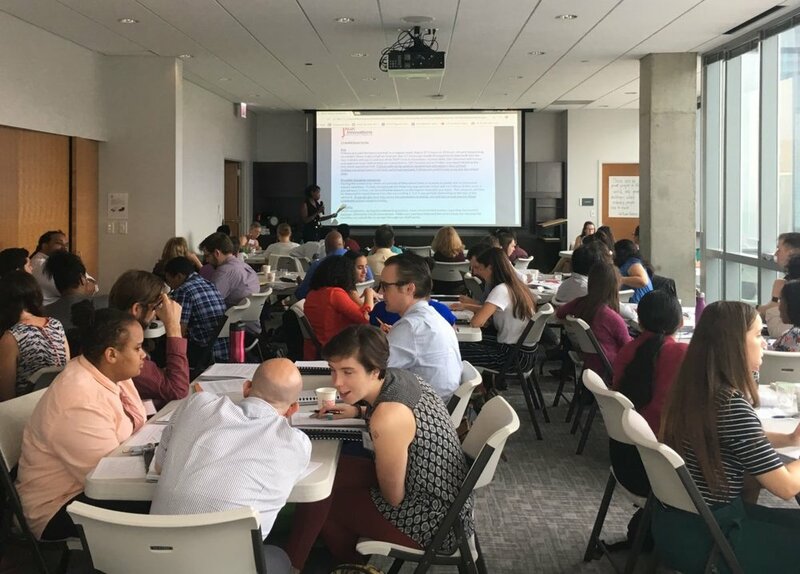 During training, Fellows get the opportunity to meet and engage with their future Site Director, learn about the educational landscape in Chicago, participate in diversity and inclusion training, explore Saga curriculum and lesson plans, and create a yearlong professional development plan. Some of the training sessions Fellows participated in this year included panels on conducting effective tutorials, nurturing a growth mindset and receiving feedback, planning lessons, promoting high expectations and grit, building teamwork, and using Common Core State Standards and RIGOR Curriculum. Common Core is a key part of the Saga experience. Through Common Core practices, Fellows create a deep understanding of math concepts with students. During training, Fellows focused on how to tie math to the real world, use multiple pathways to make sense of a solution, break down and stretch problems, and focus on the concept and problem-solving method rather than solely on finding the answer. They learned multiple strategies to challenge and push students so every student reaches their full academic potential. SagaFellows started their service at 11 schools across Chicagoland on September 4. While Saga Fellowship starts as a one-year commitment, this year nearly half of the cohort are returning Fellows. Claudy Chapman, a returning Saga Fellow and former principal, dean of students, and teacher in several Chicago schools, is looking forward to starting a third year with the program. During training, Site Directors introduced themselves and spoke about their experience with Saga and in education. Denise Parham-Gantt, a Saga Chicago Site Director and former Saga Fellow, shared memories from when they started as a new Fellow four years ago. Percy Austin, a Saga Chicago Site Director, reflected on hearing a former student speak during tutor training about the lessons they learned from their Saga fellow: “Never give up. It’s okay to make mistakes. You haven’t failed until you stopped trying.” The fact that these lessons continue to resonate with the student validates the mission Saga aims to achieve, said Austin.